Before investing in my Copic markers, I used colored pencils with blending stumps and gamsol all the time. I was happy to pull them out to play with again, but was completely sad when I found that all of my gamsol had dried up in the meantime!!! So, no blending on this card, just very elementary-school-style coloring with pencils. But I had fun and loved the way it turned out. I used Power Poppy stamps from the Play Ball stamp set. Gotta run--I need to go get this linked up before time runs out! I'm playing along with the the latest Power Poppy Power & Spark challenge, which is to "cut it out" (fussy cutting your main image), my second entry in this month's challenge. I'm having a ball with my new Power Poppy stamp sets! The floral image and "for you" sentiment are from Power Poppy's Potted Primroses stamp set. That lovely script "Mom" comes from DeNami Design. I love stitching on my cards, so I added a stitched border around a panel of some ancient Basic Grey patterned paper. And loopy baker's twine bows just make me happy, so that explains that ;). I hope that all the moms out there enjoy their special "queen for a day" day! And if you can, be sure to send your own mom some extra love today. Hello! I'm not really sure when I last posted here on my blog. I know it's been forever! I've been busy, busy, busy with my family and work. Although I've been doing plenty of papercrafty stuff these past few months, I just haven't had the energy to do all those things that go with blogging about my projects. I spent some time yesterday thinking about and digging up inspiration for a few special projects I had on my to-do list for this week, and in doing so, I cruised by the Power Poppy website and blog. I recently treated myself to a few Power Poppy stamp sets and was eager to get them inky! I noticed a post about the latest Power Poppy Power & Spark challenge, which is to "cut it out" (fussy cutting your main image), and I realized that playing in a challenge (which I haven't done in AGES!) was probably just the nudge I needed to finally post something new here on My Little Slice of Bliss. So, here I am with an entry for Power & Spark! I used the gorgeous tulip image, as well as a sentiment, from Power Poppy's Dynamic Duos: Peonies and Tulips set and colored with my Copics. The notebook paper die and coordinating notebook paper lines stamp are from My Favorite Things. And that pretty patterned paper? From an ancient Jillibean Soup 6x6 pad. I'm working hard to use up my stash! I had fun getting creative today. Thanks for taking a peek! So, my son had lots of fun trick-or-treating as a lumberjack last night! Here he is in his home-assembled costume that I described in my last post. Wanna closer look at that awesome hand-crocheted beard (scored from Etsy)? It was a very festive evening at our house last night. My daughter spent some happy time putting up a few decorations to entertain our trick-or-treaters and to dress up our dinner table. My husband even got into the spirit of things while preparing our traditional Friday-night homemade pizza. 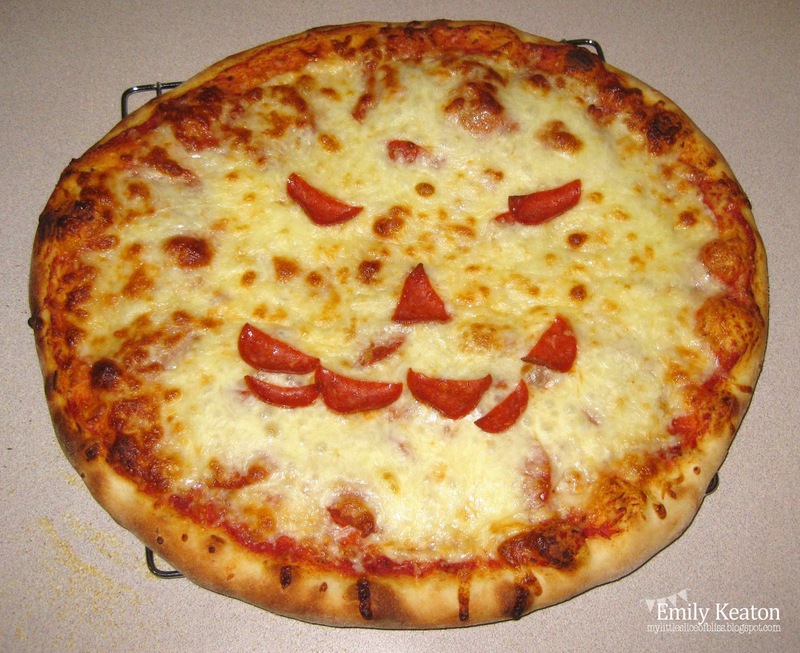 May I present the "Jack-o-Pizza?" Hope you had a fun day yesterday! It has been months since I've been inspired to write a blog post here on My Little Slice of Bliss. Rest assured, all is well here in my little corner of the world--I've just been so busy with work and family that papercrafting and blogging have taken a definite back seat. Autumn has been a whirlwind, and here we are on the last day of October already. Happy Halloween! My kids are in 6th grade and 10th grade this year. 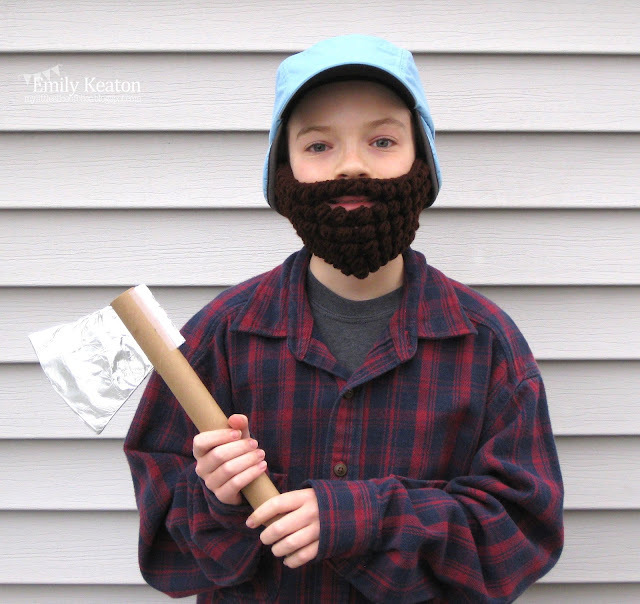 My sixth grader is excited to go trick-or-treating tonight. After masquerading as an Apple iPhone for the past two years, we decided it was time for a new costume for him. I picked up an awesome hand-crocheted beard from Etsy, and we put together a great lumberjack costume for him from items we already had around the house: hiking boots, jeans, one of Dad's old plaid flannel shirts, an ear flap cap, and a non-lethal axe we constructed from cardboard, a paper tube, and aluminum foil. At least he'll be cozy and warm tonight! Sorry, no photos yet!! 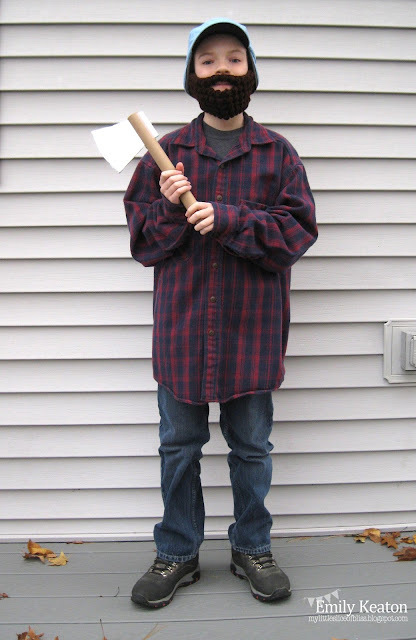 Last year my daughter decided that as a high school freshman, she was too old for trick-or-treating. She's opting to stay in again this year to hand out treats to the visiting neighborhood goblins. Because that means she'll miss out on all that yummy loot (and little brother might not be in the mood to share), I put together a little Halloween treat for her, which I'll share once her lil' bro heads out to haunt tonight. The gift bag is a pattern from DeNami Design, and it's the perfect size for two Reese's Pumpkins. Love those! And speaking of my daughter, she got crafty yesterday and used my DeNami stamps (and my patterned paper and dies . . .) to decorate packets of hot cocoa mix to hand out to our trick-or-treaters tonight. Aren't these adorable? I think she did an awesome job :D.
Well, I hope that you and yours have a fun Halloween. Thanks for dropping by! The wonderful folks at Top Dog Dies sent me three fantastic die sets to play with--Top Dog Dies Birds & Nest, Top Dog Dies Vintage Alphabet, and Top Dog Dies Tag Album--and I couldn’t wait to get started with them. I made three Top Dog Dies projects in all, and you'll find the first two over on the Top Dog blog today. One is a set of note cards and the other is a masculine birthday card. I hope you'll go and check them out! My third project is a gift tag that I made to coordinate with a lovely box I picked up (on clearance!) at IKEA recently. I thought it would make the perfect gift box! I used the smaller tag from the Top Dog Dies Tag Album set and diecut letters from the Top Dog Dies Vintage Alphabet set to personalize it. The apple stamp and sentiment come from Unity's to the core! Itty Bitty stamp set. 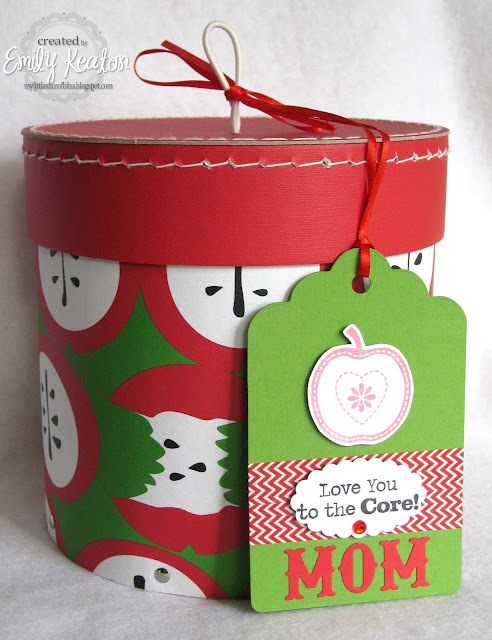 Perfect for Mom's next birthday, don't you think? And now, how about a giveaway? Top Dog Dies is doing a guest designer giveaway for the whole month of August! The winner will receive $50 worth of exclusive wafer-thin dies of their choice from Top Dog Dies. Enter HERE! Deadline to enter will be Sunday, August 31, 2014, at midnight Central Standard Time. Thank you so much for dropping by to visit me today. 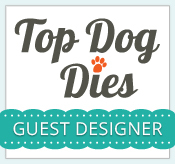 Don't forget to visit the Top Dog Dies blog today to see my other Top Dog projects AND enter the Guest Designer Giveaway!! Have a day filled with bliss! So today's post is a little different! My dear friend Colleen Dietrich, of Dietrich Designs, called me last week to ask if she could tag me as part of a blog hop she is participating in. It seems that the goal of the hop is to learn about other blogger/artists by sharing some details about one's self, one's work, and one's creative process in a fun "interview" style blog post. The posters were encouraged to tag one or two fellow bloggers to share the fun, and I'm so honored that Colleen chose me! 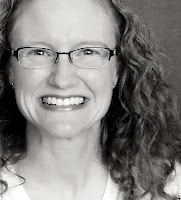 Colleen asked me to share some details about myself in this post today, so here goes . . .
1) How do you know Colleen? I first "met" Colleen on Splitcoast Stampers sometime after I first joined that online community in 2009. She always made the most beautiful cards and left the most wonderful comments. Not much has changed in either area! Before long we were sending PMs (that is, private messages) through Splitcoast, then exchanging our email addresses for more direct access, then snail-mail addresses so we could mail cards to one another, and finally phone numbers so we could chat even more easily. It has been a wonderful journey building this friendship of ours! To have someone to chat with about our shared papercrafting interests has been a godsend--someone who understands the drool-worthiness of a new stamp set or paper collection, the thrill of finding fun paper punches or dies on clearance at Michael's or A.C. Moore, the joy of being asked to join a design team, the frustration of losing one's creative mojo, the elation of having a papercrafted project accepted for publication, or more often: the dejection of not having a project accepted for publication. 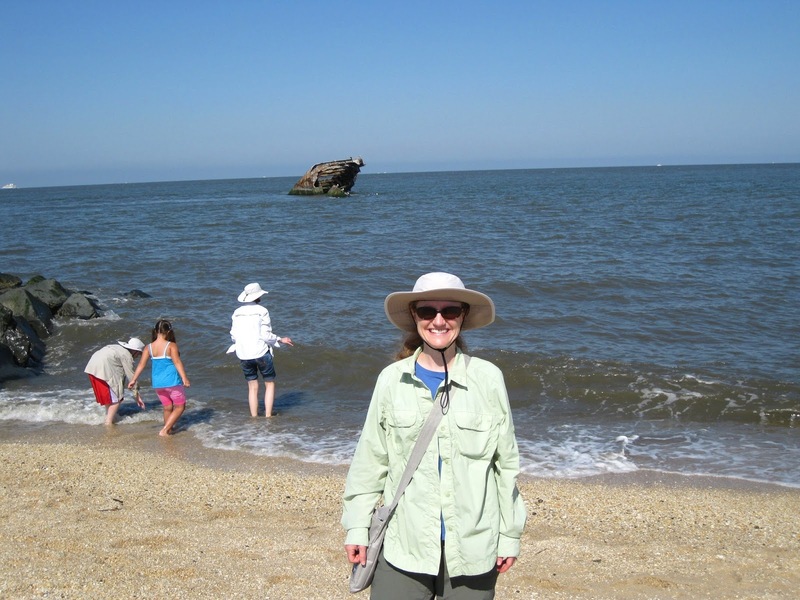 Colleen was the one who encouraged me to start this blog in 2010 shortly after she had established her own. And then we had yet another interest in common: the world of blogging! Even more to chat about ;). But we aren't just papercrafting/blogging friends. Over the years, we've discovered we have so much more in common than our shared hobbies. These days we call one another to chat about our families, our jobs, our health concerns, our vacations, our daily triumphs and aggravations, our joys (and frustrations) of motherhood, and more. I am so blessed to count Colleen among my very closest friends!!! Thank you from the bottom of my heart, Colleen, for your gift of friendship!!! Well, as much as I'd like to say that I'm knee-deep in challenging, meangingful, and creative papercrafting projects right now, that would be the furthest from the truth. In fact, I just noticed that my last post on this blog o' mine was on June 26, over a month ago! I do believe that's the longest lapse in posts I've ever had on this blog. Yikes! I never intended for that to happen, but sometimes everyday life gets in the way of the best intentions, right? So, since the end of my kids' school year the last week of June, my 11YO son went away to a week of arts camp sponsored by the Boston Symphony Orchestra; my 15YO daughter and I went away on a trip to Burlington, VT, with her Girl Scout troop; my hubby and I celebrated our 21st wedding anniversary; our family worked together to replace our disintegrating wooden deck with new Trex planks and vinyl-clad aluminum railing systems; AND our family went away for a week to celebrate my parents' 50th wedding anniversary! 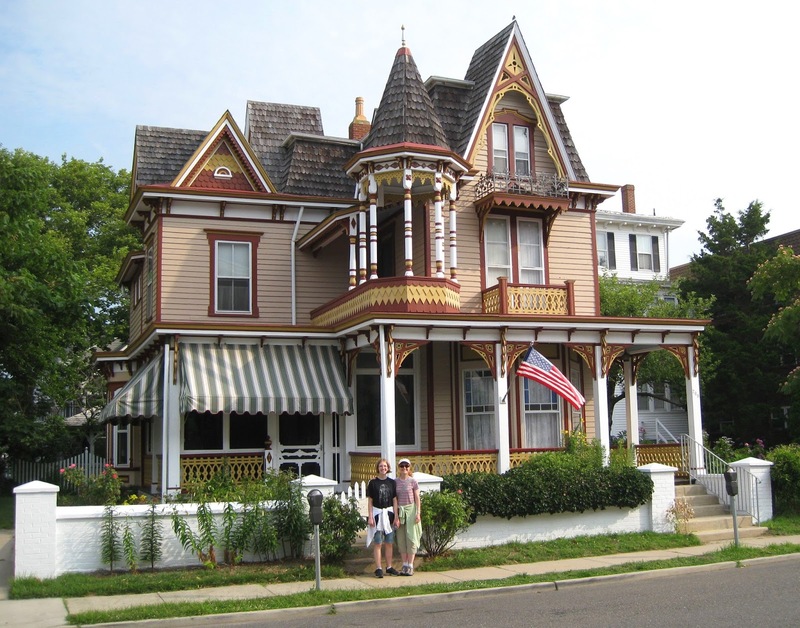 As our gift to them, my sister and I rented a Victorian house in Cape May, NJ, for her family, my family, and my parents to stay in while vacationing for the week. What a lovely time that was for the three generations to hang out together! That's me in the sunglasses posing in front of a shipwreck just off Sunset Beach. In the background, the cousins are folicking in the waves along this pebbly beach known for its superb beachcombing. 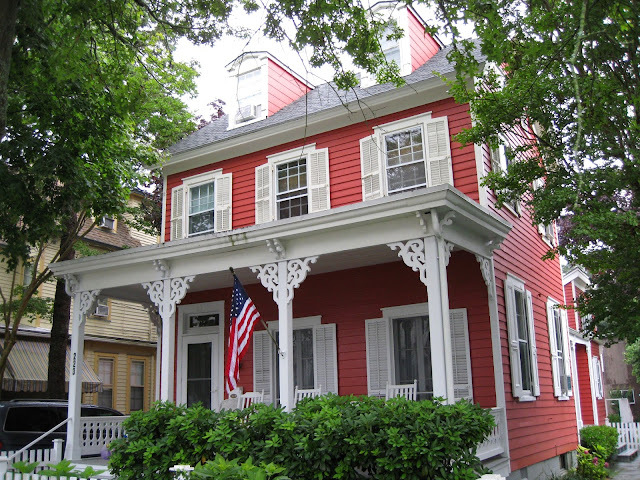 The Dr. Henry Hunt house in Cape May's historic district. We found it on one of our early morning walks and just had to take a photo. We found out later on a trolley tour of historic Cape May that it is one of the most-photographed examples of "drunken" Victorian architecture--known as such because it combines elements from multiple different Victorian styles all in a single "drunken" mish mash! 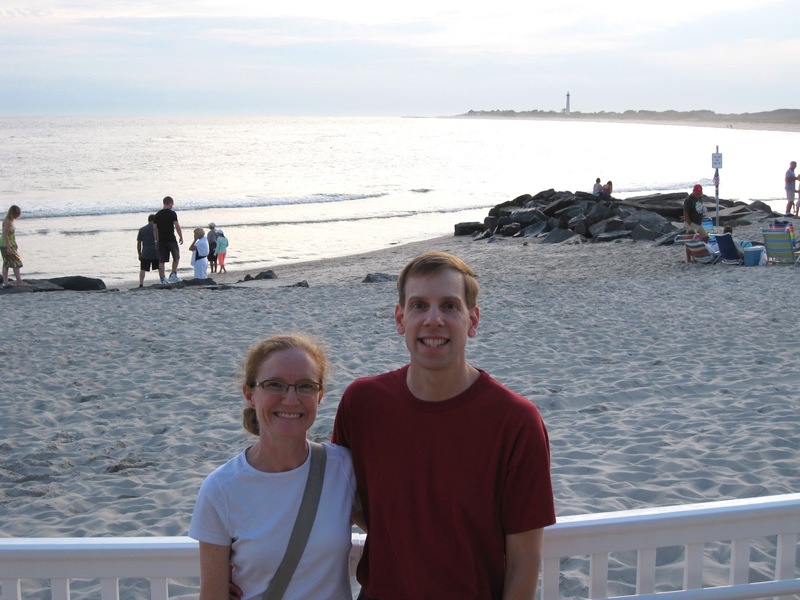 My hubby and I near Sunset Pavilion at the end of Cape May's Promenade just before sunset. See the Cape May Lighthouse in the distance? 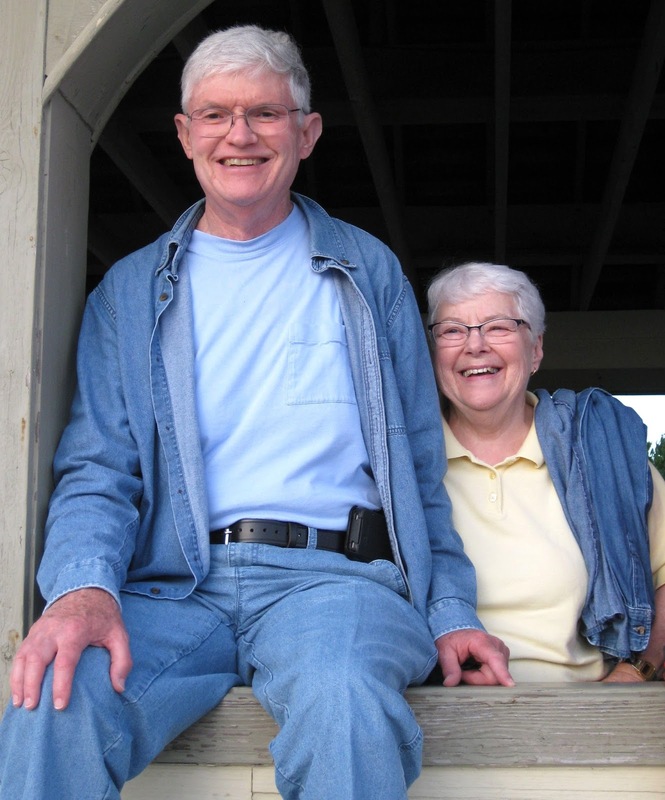 My parents, the happy Golden Anniversary couple! So I guess that's what I've been "working" on right now! I'm happy to report, though, that I'll have an all-crafting post to share with you soon as part of a guest-designing gig I'm really thrilled about! More on all that later. Stay tuned!! 3) What is your signature style? I like to dabble in all sorts of different styles! I play around with clean and simple, shabby chic, vintage, bold and graphic, fun and cute, layered and frilly, elegant and classy, punch art, . . . you name it, I've probably done it. I generally use the projects I create for my own purposes (as gifts to give, or birthday cards to mail to friends and family, etc. ), so I guess overall you might describe my signature style as "mailable!" I like to make relatively flat cards to make them as USPS-friendly (and low-postage!) as possible! 4) What are your favorite types of projects to make? I enjoy making all kinds of projects! Cards are easily what I make the most of, but I think my favorite projects to make are papercrafted gifts to give. This past spring my daughter and my nephew were both confirmed at their respective churches. I enjoyed making each of them some commemorative gifts to mark the occasion. 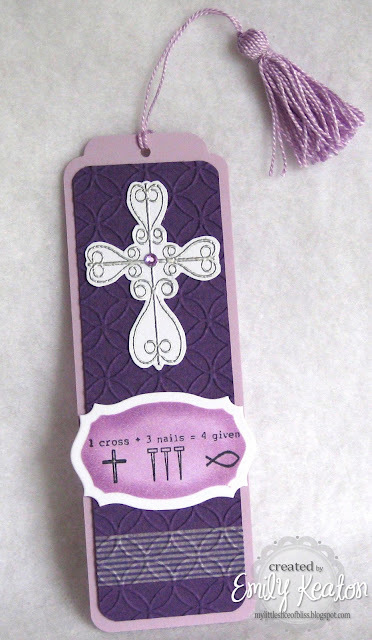 I made each confirmand a papercrafted bookmark perfect for use in their favorite Bibles. Each bookmark was personalized on the back with the occasion and date. 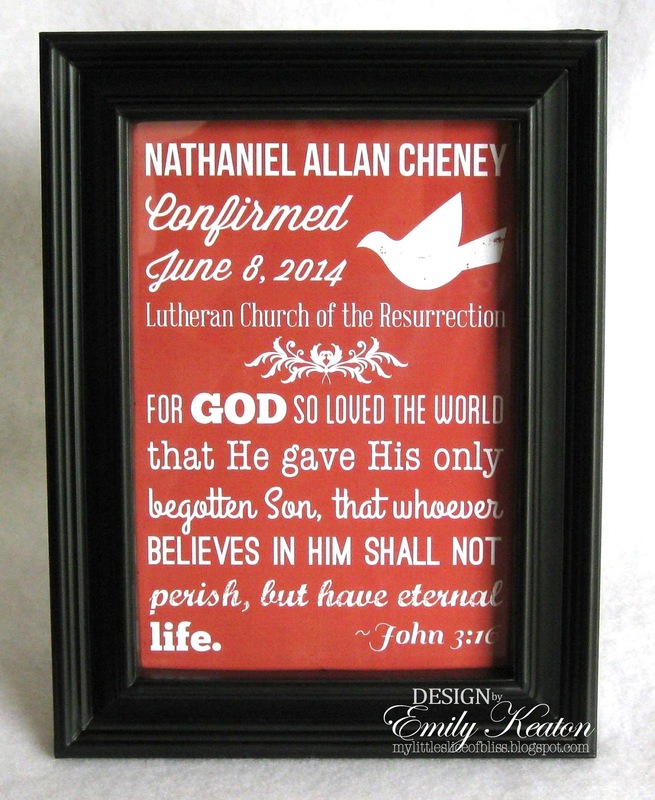 If you are interested in seeing more of my papercrafted gift projects, please be sure to check out these "Gift Idea" posts! Well, readers, thank you so much for sticking with me through this long post! I think I'll wrap it up here. A huge THANK YOU to the fabulous Colleen for inviting me to post with her today. 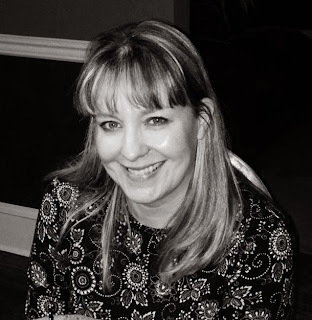 If you have arrived here outside of the blog hop, I'd love it if you popped over to meet Colleen and say HI! Her work is so beautiful and elegant--I know you'll love visiting with her!! Thank you so much for visiting today!! I hope that your summers have been swell thus far and continue to be. Hello and Happy Thursday! I'm announcing my Embossed Elements giveaway winner today. 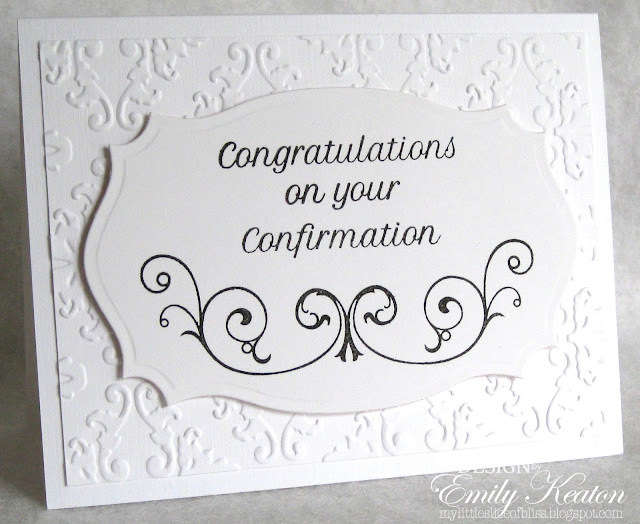 The brand-new Cloudy Sky Embossing Folder goes to lucky #23, which is Nikki C.! Congratulations, Nikki! Please email me (you'll find my email address on my "Complete Profile" page--see the right-hand sidebar under my picture) with your snail mail mailing address so I can get this embossing folder sent out to you ;). I used a sweet stamp from the Fancy Flutters set, a sentiment from the Thoughtful Greetings set, a Crystal Lacquer Pearl Pen, and some pink baker's twine. I think my daughter will love how it turned out!! Thanks so much for dropping by for a visit today! It's the fourth Wednesday of June and that means it is time to show off another awesome DeNami Design stamp with a blog hop! 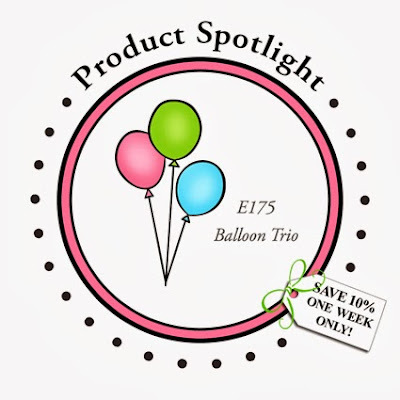 This month we are featuring the celebratory Balloon Trio stamp. In addition to the Balloon Trio stamp, I put the Starry Burst stamp and Stars Embossing Folder to use in this design. I rather like how this design turned out. My daughter says it reminds her of fireworks! It's a little something different, that's for sure ;) . Thanks for stopping by today--have a day filled with bliss! Hi, everybody! 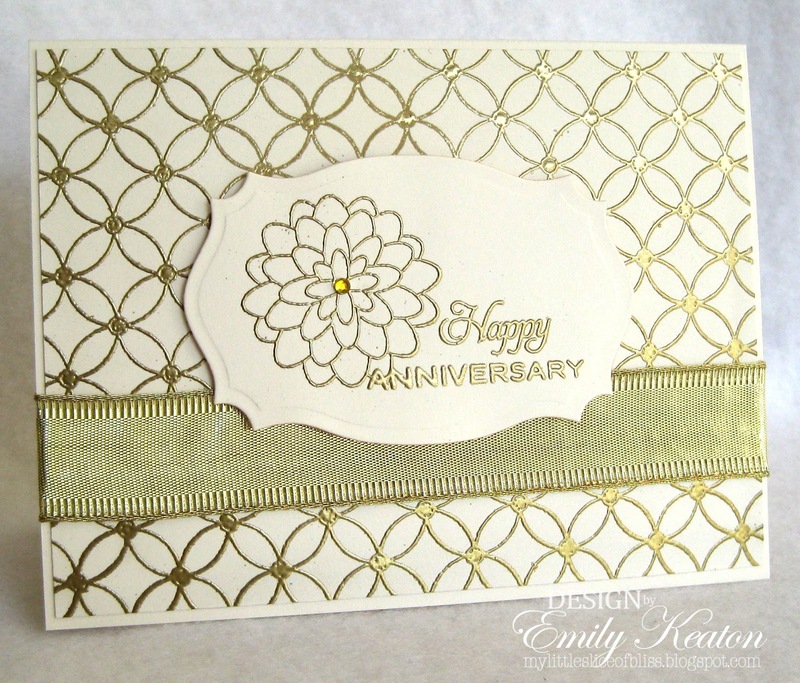 I'm coming to you today with the June edition of my monthly Embossed Elements feature for the DeNami blog. 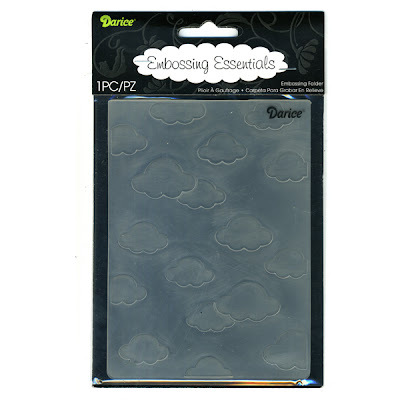 Today I'm featuring a truly versatile item: the Cloudy Sky Embossing Folder from the DeNami store. There are just so many different ways to use this awesome design! My first card is a sweet all-purpose card. It uses just one DeNami stamp (Noah's Ark), and two embossing folders: Cloudy Sky and Beach Waves. I think this would be so cute as a baby card, a baby's first birthday card, or even a thank you note for a Sunday School teacher! My second card is perfect for the 4th of July! I again used the Cloudy Sky embossing folder as a backdrop, this time for an outdoor celebratory scene featuring Chickie in Balloon, Chickie w/ Sparkler, and Patriotic Chickie. 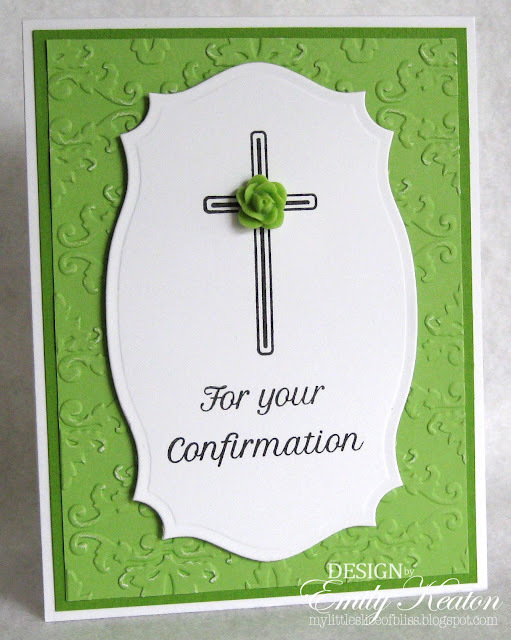 The sentiment comes from the Everyday Greetings stamp set. I hope this gives you some ideas you can use with the Cloudy Sky embossing folder! Thanks for taking a peek at my embossed projects today. Be sure to check out my giveaway! I'll leave commenting open until 11:59 p.m. EST on Wednesday, June 25, 2014, and will draw one commenter at random. The winner will be announced right here on my blog on Thursday, June 26, and if I'm able to find an email address, I'll be sure to contact the winner as well.